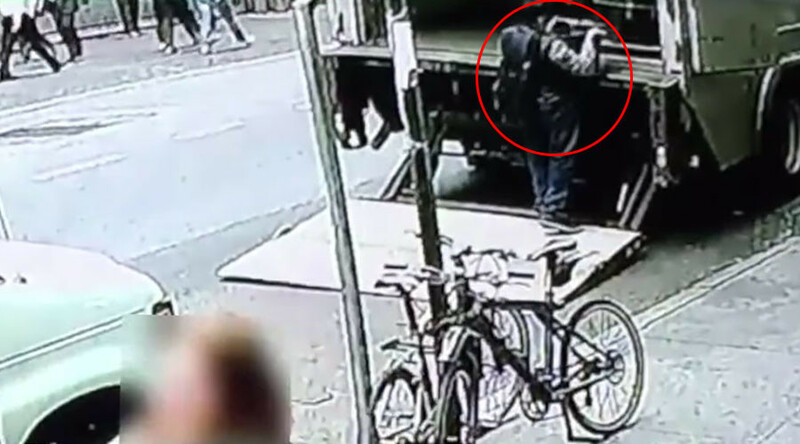 In a daring daylight robbery in New York’s Diamond District, a thief grabbed a bucket of gold dust he saw stashed on the back of an armored truck. Surveillance video released by police on Tuesday shows the robber struggling with the five-gallon bucket, making frequent stops. The bucket of gold flakes was worth $1.6 million and weighed 86 pounds, according to the authorities. “I think he just saw an opportunity, took the pail and walked off,” New York Police Department Detective Martin Pastor, who is overseeing the investigation, told WNBC. The daring daylight heist took place on September 29. The thief took advantage of one guard leaving the truck to make a pickup on 48th Street, also known as the Diamond District, while the other guard headed to the front of the truck to grab his cellphone. The 20-second window was enough for the thief to grab the bucket and make off with it. Surveillance footage released by the NYPD shows the robbery from several angles. Several photos have also been made public, which show the thief setting the heavy bucket down several times to take a breather. Police said it took him an hour to walk the distance normally traversed in about 10 minutes. He eventually jumped into a van at 49th Street and Third Avenue, which drove off. Police believe the man had no clue what was inside the bucket.